Donald Trump’s derogatory comments about women continue to make news. It is strikingly clear that these childish and hurtful comments don’t much matter to his supporters. And why should they? Earlier in the campaign, Trump boasted at a rally that, “I could stand in the middle of 5th Avenue and shoot somebody and I wouldn’t lose voters.” He’s probably right! Trump supporters are mostly White men above the age of 35. 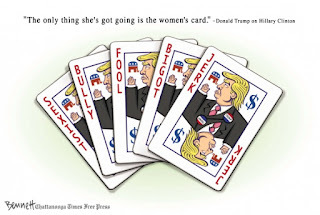 Let me personalize the women’s issue for those Trump supporters out there who are not troubled by his elementary schoolyard bullying of women: What if Trump called your wife, or your mother, or your daughter, or your lady friend a “fat pig?” Would that be OK? Would you be good with it?